The 8th March 2018 marks the centenary of the death of James Maxwell Hampson, former labourer at RBGE. He was born in around May 1891 in Neston, Cheshire, to Henry Hampson, a hewer in the mines, and his wife Susan. He joined RBGE as a labourer on the 2nd April 1914 (although he lists his job as gardener with H.M. Office of Works on his enlistment form). On the 31st August 1914, less than a month after war was declared, Hampson enlists in the 5th Royal Scots, interestingly, making a point on his application form of scoring out the four years he’s being asked to enlist for, and replacing it clearly with 1 year – seemingly he didn’t want to be away for long – it’s as if he thought he could agree to serve for one year and then leave? But clearly it didn’t work out this way for James. JM Hampson’s Service Record card held in the RBGE Archives. The ‘Nil’ under Decorations is not correct – Hampson was awarded the 1914-1915 Star, British War Medal & Victory Medal. Photograph of James Maxwell Hampson in possession of his family. 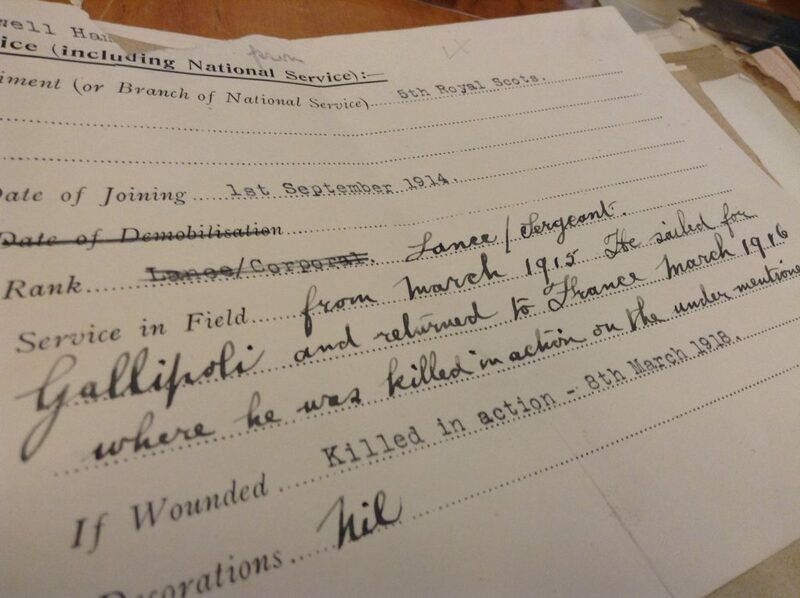 After a brief period of training, James was sent to Gallipoli in April of 1915 as a Private. He must have impressed, as he was promoted to Lance Corporal at the beginning of May. After being evacuated from Gallipoli at the end of that campaign, Hampson is then posted to the Western Front in France in March of 1916 before being promoted to Corporal in July. At the beginning of 1917 he returns home, suffering from trench fever, a moderately serious bacterial disease spread by body lice, the symptoms including high fever, headaches, skin lesions and sore muscles, especially in the eyes and legs. Hampson doesn’t return to France again until the end of July when he rejoins what is now the 5/6 Battalion Royal Scots (an amalgamation of two depleted battalions) who are about to spend a few months “squatt[ing] on the coastal sector near Nieuport” (Ewing’s History of the Royal Scots, p.548). In December 1917 he is promoted again, this time to Lance Sergeant, and he’s now into his fourth year of service having survived the killing fields of Gallipoli and the Somme. According to Major Ewing in his History of the Royal Scots, 1917 and early 1918 were spent relatively quietly, in training and conducting the odd raid into German territory. He refers to what happened on the 8th March 1918 as “the next thrill”, when the 5/6 Royal Scots were acting as brigade support. This time it was the Germans who attacked, breaking through the Allied line. At 9am, two companies of the 5/6 Royal Scots were sent to support a counter-attack and moved forward under raking shell fire. The counter-attack was a success and the British regained the line, with the Royal Scots’ losses not being considered heavy, five men killed and fourteen wounded. The men killed are not named, but they presumably include Lance Sergeant James Maxwell Hampson who would have been 26 years old; a heavy enough loss for RBGE and the families of the men involved. 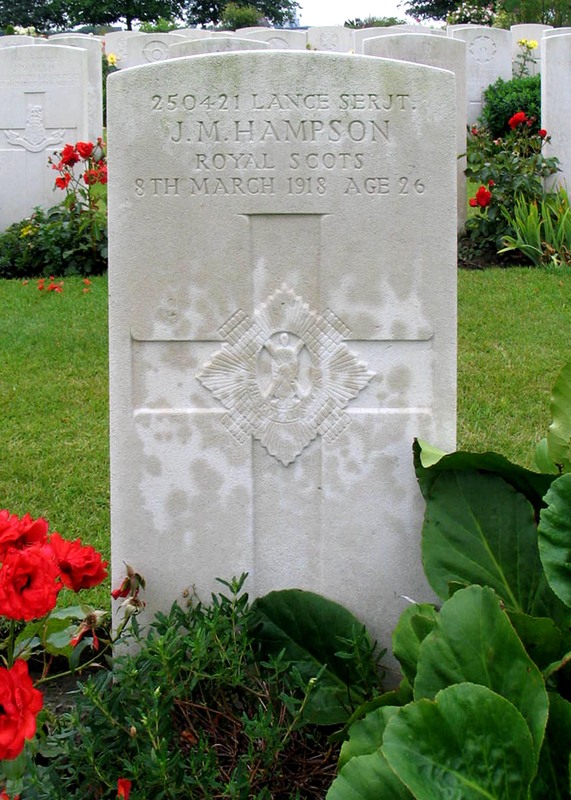 Hampson’s body was buried at Paratonniers Farm Cemetery, but was moved to New Irish Farm Cemetery to the north of Ypres after the War. We will remember him. 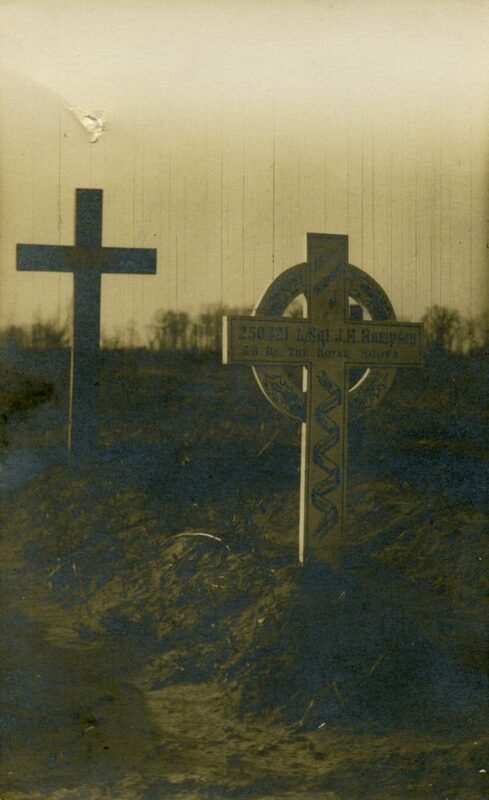 With thanks to Garry Ketchen for his genealogical research and his permission to use it, and to Steve Rogers at the War Graves Photographic Project for his help in finding images of Hampson’s grave and his permission to use them. Ewing, Maj. John, “The Royal Scots, 1914-1919”, Oliver & Boyd, Edinburgh, 1925. 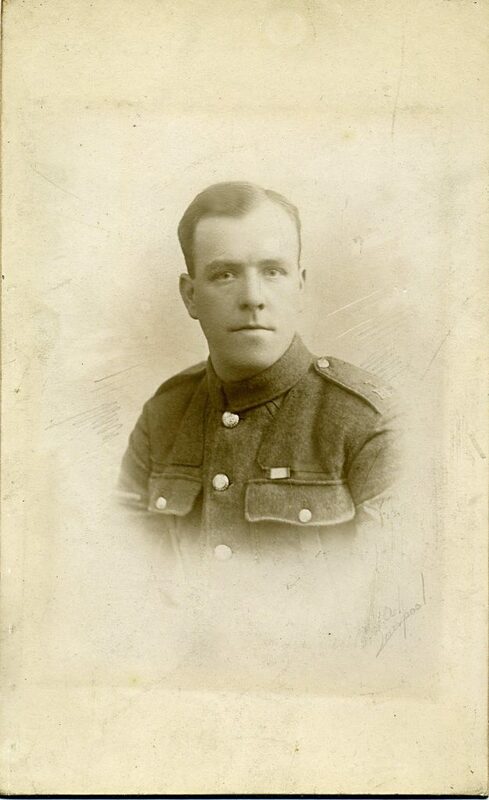 Update: in November 2018 I was so pleased to be contacted by members of Hampson’s family (see Comments below) and was astonished to be sent a copy of a photograph showing Hampson in his army uniform as shown above, possibly taken during his period of home leave in 1917(?) – thank you so much to Susan and her sister for this. I have been looking through your site concerning the first world war and notice you have posted information about our great uncle James Maxwell Hampson. It was interesting to find out some information about him. My father was also named Maxwell Hampson after him. Unfortunately my father was killed at work quite young and my grandfather James Maxwell’s brother also died young from a road accident. It would seem that my sister and I are the only Hampsons from the family to survive so we have never been able to find any information. So it was great to actually read something about him.